I had high hopes for this cereal. Cinnamon Life cereal is my second all-time favorite cereal. As both a chocolate lover and a fan of Life cereal, I'm sad to report that this new cereal is a disappointment. The first bowl I tried was terribly bland. There were very few "chocolate flavored oat clusters" and they barely impacted the flavor. What I seemed to have was a bowl of ordinary Life cereal with a more natural oat-like flavor and few chocolate specs. Yawn. As the week progressed, I discovered that the small chocolate clusters had settled to the bottom of the box. Every subsequent bowl I had was a little more interesting, but never anything to get excited about. Near the bottom of the box, I finally had a bowl where my spoon actually looked the spoon on the cover of the box - two chocolate clusters to every six or seven cereal pieces. It finally started tasting like a cereal that deserved to have the word chocolate in its name. Unfortunately - despite the "made with REAL CHOCOLATE" claim on the box - the chocolate in this cereal tastes mildly synthetic. Count Chocula and Cocoa Puffs have more authentic chocolate flavor. My biggest complaint is about the texture of the chocolate "clusters". They're very small and compact and maintain a serious crunch in milk. But the crunch is more like a mistake. Imagine eating a soft, moist muffin and you bite into something crunchy. You'd be inclined to spit your bite into a napkin and make sure there wasn't something strange in your muffin. The texture of this cereal can be simulated by pouring some Grape-Nuts into a bowl of Life Cereal. They both have great textures, but they're not meant to be together. This is strike two for Quaker and Life cereal. 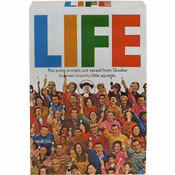 In early 2006, they introduced Vanilla Yogurt Crunch Life. "They taste kind of musty... kind of old," read a portion of our review for that cereal. If our friends at Life cereal want to keep experimenting with clusters, they need to eat some of their competition. There's been great advancements in nuggets and clusters over the last two years (see Kellogg's Caramel Nut Crunch and Cran-Vanilla Crunch). Sadly, the final word on this new cereal is that Chocolate Oat Crunch Life is pretty lifeless. No one will be dying to try a second bowl of this Life. 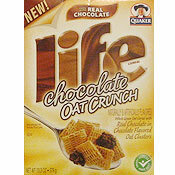 What do you think of Chocolate Oat Crunch Life? I see a review that is from August 2008.. They still have this junk on the market? I wrote to Quaker in April 2007 to tell them this was terrible. My reason is different than others.... I found that the clusters were so hard, that they caused the Life squares to break down and become tiny little bits of Life cereal, making the disparity between soft and hard even more pronounced. The chocolate might have 'some' chocolate in it, but as a choco-holic, this is NOT chocolate and is waxy, as the other reviewer commented. A TERRIBLE cereal, to say the least. SO good. But if you pig out and start eating the whole box, like I do, the chocolate starts getting waxy on your tongue. Strange and stale smelling and tasting! Couldn't finish the first bowl. I loved this cereal, great for breakfast or for a late snack! This cereal had an odd texture. The chocolate flavor tastes really fake and kinda gritty. I too was sorely disappointed in this cereal. The chocolate flavor is very lacking and tastes weird and the clusters are too crunchy. Life and Cinnamon Life are great, but when it comes to clusters they need to go back to the drawing board! Not worth buying again. For chocolate lovers, this wasn't "love" of any kind. I ate the whole box by myself... delicious! and with soy milk. I use soy milk and mine taste like a healthy snack. It's got the sweetness of chocolate, crunchy bits, plus it's low in fat and high in fiber. As a woman, I will turn to this when I get my PMS instead of a Snickers bar. And if you take my bowl away, I will hunt you down like a chocolate bunny rabbit, ripping off your head first!! Happy Easter!! It tastes funny to me. I was really disapointed! All other Life cereals are great, this one really missed the boat. Plus, it smells funny! The chocolate crunch in this cereal tastes ABSOLUTELY NOTHING like chocolate to me. Reminiscent of cocoa, yes. Chocolate definitely not. Don''t they test market this stuff? I thought it was practically inedible; the only saving grace was that when you pick out the chocolate pieces ( which I did after the first bowl, rather than throw out the box, which was a viable option) you are still left with the life cereal. I had hight hopes when I bought it, but it was a total waste of money. I thought this was a great cereal! Especially since it is whole grains, real chocolate, and not fattening, this is a healthy breakfast cereal (or yummy snack!). This cereal tasts really good without milk.